A brush with Bollwood stars, encounters with Maoists besides exposure to election campaigning enlivens the narrative of a rare backpack Chinese woman’s transformative journey to the nooks and corners of India. 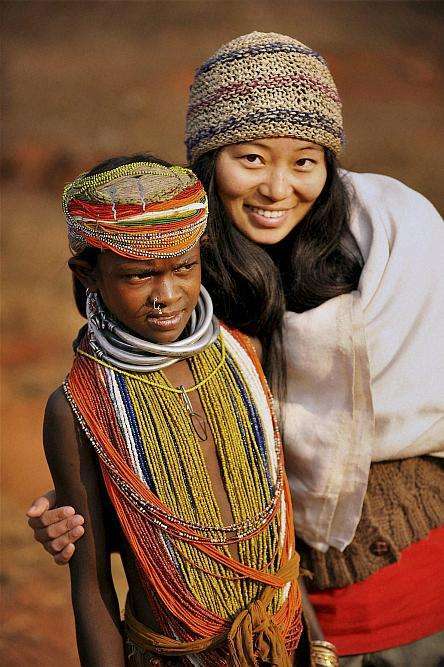 Hong Mei, 34, who travelled India for several months in 2009 along with her American husband, Tom Carter, released her travelogue book in Chinese titled The Further I Walk, the Closer I Get to Me, stated to be the first such account by a contemporary Chinese about India. During the visit, she participated in festivals and events like Kumbh Mela, Pushkar Camel Fair, Holi besides the General Elections campaigning in 2009. Pushed by Tom, who had done a pictorial book along with her on all the 33 provinces of China highlighting its diversity, Hong had relatively comfortable travel in India as he was mostly mistaken as someone from India’s North-East provinces or from Japan. Hailing from a small village in China’s Jiangsu Province, strangely India was her first trip abroad. In her nearly one year travel made in the gaps of few as she was granted only three months visas, she and Tom covered most of part of India except the North East where Chinese have no access as most of it bordered along China. Travelling with a budget of about USD 20 a day, the two, however, had a good exposure to Indian way of life in the North, South and Western regions. Perhaps the height of their Indian exposure was when touts approached them to act as extras in Shahid Kapoor’s Bollywood movie Dil Bole Hadippa in which Tom was chosen as 10th batsman in the cricket match scene. Hong and Tom also had an opportunity to appear in a commercial advertisement with Aamir Khan. While in Mumbai, Hong had a insightful exposure to 2009 elections as the candidates canvassed in a festive spirit. For someone hailing from country with a One-Party-rule (Communist Party), it was a spectacle of political harmony. Both had an enduring experience feeling the heat travelling in areas where Maoists are active in Orissa. Significantly Hongs accounts of elections as well as her Maoist encounters were edited out of book as authorities in China were cagey about such narratives influencing the Chinese. The two had close calls travelling to India’s border areas with Pakistan in the Kutch region of Gujarat as well as the Wagah border point on the Indian side of Punjab. Her best moments in India were taking part in the cultural festivals like Holi and the worst part was she missed her regular intake of food due to excess exposure to vegetarian food in India while Tom fell sick grappling with poor immune system. Hong said her ground breaking backpacking journey to India illustrates a growing trend among new Chinese middle classes to quit their jobs to hit the roads abroad. Last year nearly 100 million Chinese travelled out of China spending billions of dollars. India where over lakh travelled last year is trying hard to woo more Chinese to visit with a liberalised visa regime. Indian travels in a way impacted her as she says the religious fervour in India had left a mark of influence as she turned spiritual. She is also thinks that despite trying conditions, Indians appeared happier compared to their Chinese counterparts despite their material success.